I’m going to take you back. Back to the interregnum. The time last year when 4e was being wound down, and the playtest for 5e was underway. It was a big transition for D&D, one that continues today. It was also a time when the D&D fan didn’t really know what to look for on the shelves. WotC experimented a bit, and this is one of those offerings. 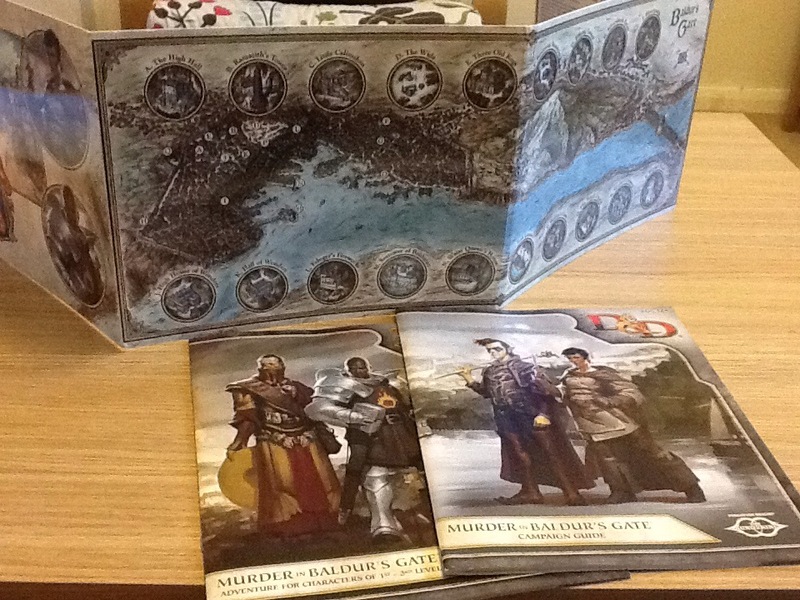 It’s an adventure, for levels 1-3, and it’s set in Baldurs Gate in the Forgotten Realms. Now, I’m a real novice when it comes to all things Realmsian, but I’m led to believe that Baldurs Gate has a lot of traction in the wider hobby, what with those new fangled computer game things. This adventure is subtitled as being part of an ‘event’ called The Sundering. Not sure what that is, but like comics, it’s safe to assume there’s always some meta plot going on in the background, probably to allow for crossovers, into novels etc. so that’s fine. 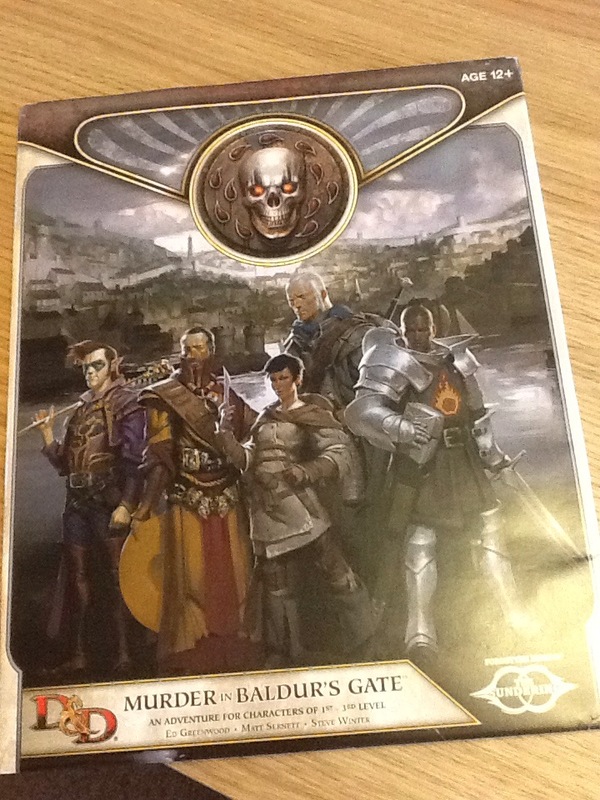 The intro says it’s set in the years following 1479, when the gods designate mortals to be their Chosen with a capital C.
It’s written by Ed Greenwood (Realms creator), Steve Winter (TSR alumni) and Matt Sernett (who I last saw writing for 4e) so there’s a spread of talent right there. Steve Winter ended up at Kobold Press who delivered the less than stellar Hoard of the Dragon Queen for 5e. Hmmm. A word on format. The adventure itself is a 32pp magazine style offering. 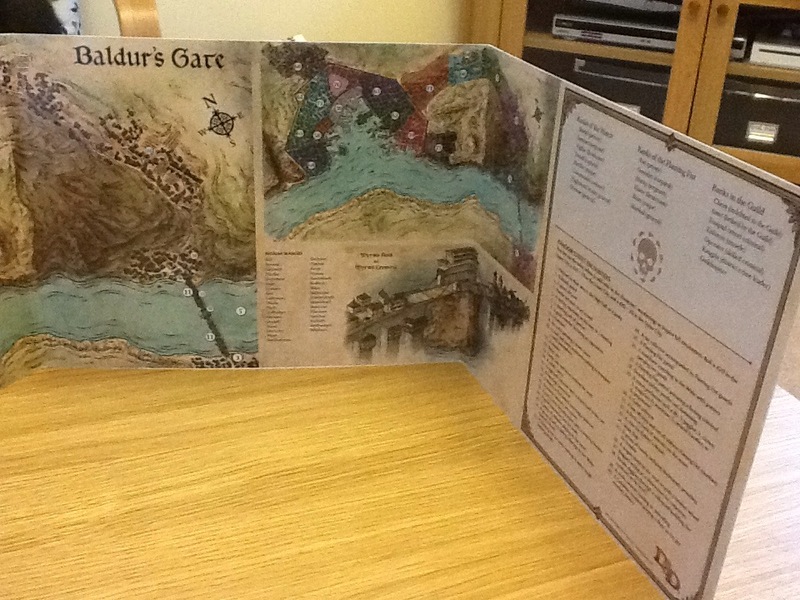 It’s accompanied by a 64pp city/campaign guide, and the whole shebang comes wrapped in a custom 4 panel, landscape, DMs screen, plus paper sleeve. I love that. 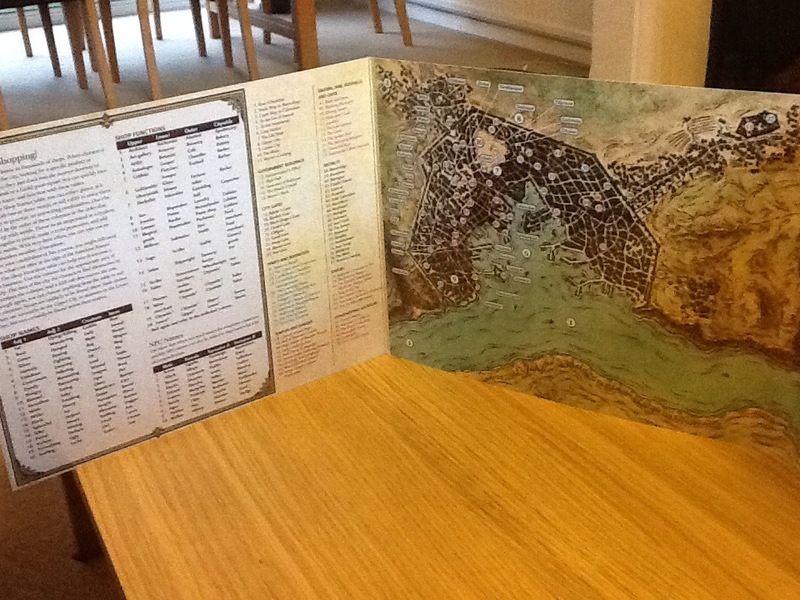 It reminds me of the old school 1e adventures that came with the card covers that doubled as screens. Photos of all this below. Plot wise, this is a murder story, and not a dungeon or hex crawl. It’s designed to be one where the DM is forced to improv along the way, and pursue factional agendas which the characters interact with throughout. It’s flagged up as experiential rather than a straight down the line mission. I’m down with all that, because it’s laid out early so there’s no surprises. Even the stats will need a DMs intervention, because this one is written with no edition in mind. The stats for 3.5, 4 and Next are available online to be plugged in. Even the number of foes is malleable. I’m not convinced that 4e especially will be well served by this approach, but we will see. Ok, I’m excited by this set up, and the materials are enticing. I’ll set to spoilers next time out and let’s see if it lives up to its initial billing. Here are those shots. I’m a big Realms fan but hate what they did with The Sundering. That said, this looks lovely. Do the year and The Sundering play much of a role in the adventure or could they be easily changed? Don’t know yet! Watch this space. Keep in mind The Sundering and The Spellplague are two different things.